The battle heats up at the northern end of the line. 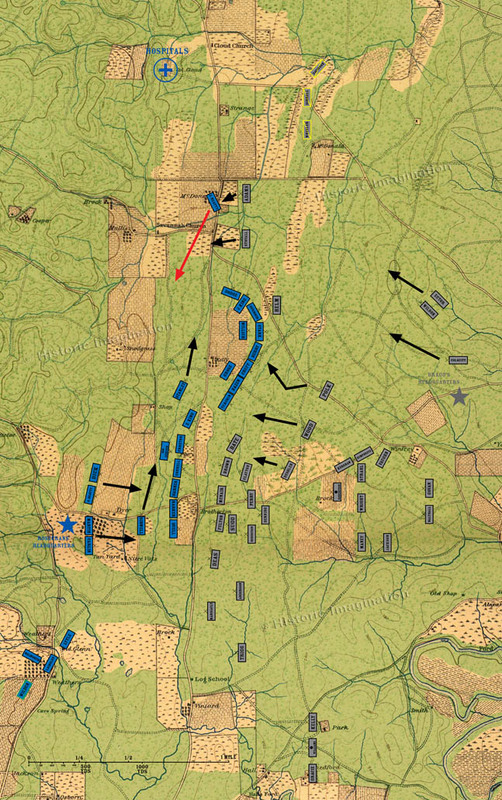 John Beatty’s brigade is routed from the fields of the McDonald farm by Breckinridge’s Division, though half of Helm’s Brigade remains stalled in front of the main Union works. Union reinforcements are on the way, with the remaining two brigades of Negley’s division marching north. Davis and Van Cleve’s divisions are moving forward toward the front lines and a closer supporting role. Continuing the en echelon attack, Cleburne’s Division steps off to attack. Walker’s Division of the Confederate Reserve Corps begin their march from their morning bivouacs toward the front lines. The exact timing and route of their march is unknown.